Posted on March 21, 2013	by Judah Gutwein, L.N.H.A. During the recent hurricane Sandy in 2012, Regency nursing facilities across New Jersey brought in a high volume of elderly evacuees from the local hospitals and community shelters. All patients were provided with room, board and high dosages of compassion. Those who needed oxygen, nebulizers and therapy, got plenty of it as well. Post Hurricane sandy, Regency received accolades and recognition from the entire spectrum of city and hospital officials for their exceptional handling of the crisis within their communities. 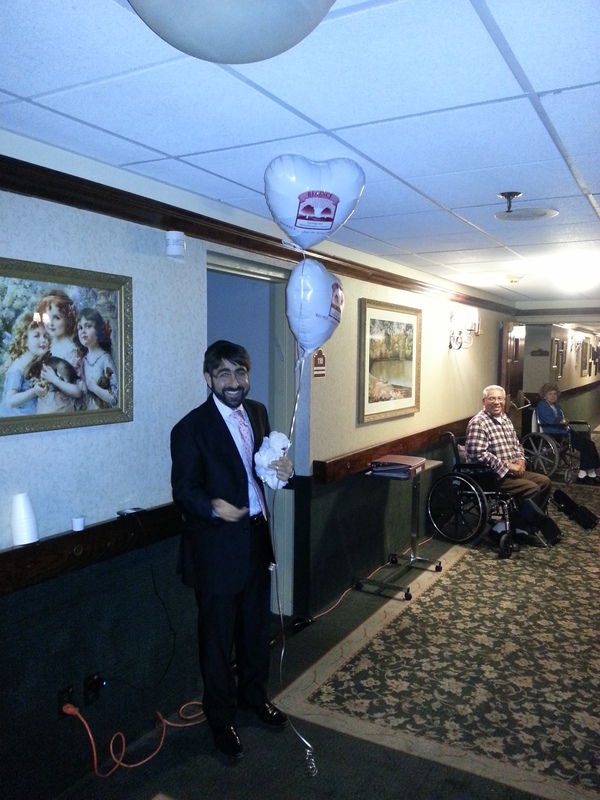 Here is a picture of me at Regency Park in Hazlet during the thick of the storm delivering balloons and a teddy bear to a new admission! We were dealing with internal issues related to the hurricane at the time and were operating off of our generators. The picture was taken by Tzvi Gross of our Administration. The incredible testament to our impeccable handling of these affairs is that our residents, patients and their families were not adversely affected by the hurricane in the slightest! Our dedicated staff worked overtime to provide the exceptional care which has become our hallmark and there wasn’t even the slightest discernible change in the quality of life which our residents have come to enjoy (and expect)! This entry was posted in Regency Staff Spotlight, Tidbits. Bookmark the permalink.